This time tomorrow Gracie May will be with us in her new home. Sasha is really looking forward to having a sister! oh how very exciting. I can't wait to see pictures of her once you get her settled in. hopefully Sasha will be a fantastic big sister and NOT teach her the TP tricks. Hugs!! Oh and there's a new bed waiting for her! Yes, show us your pics!!! 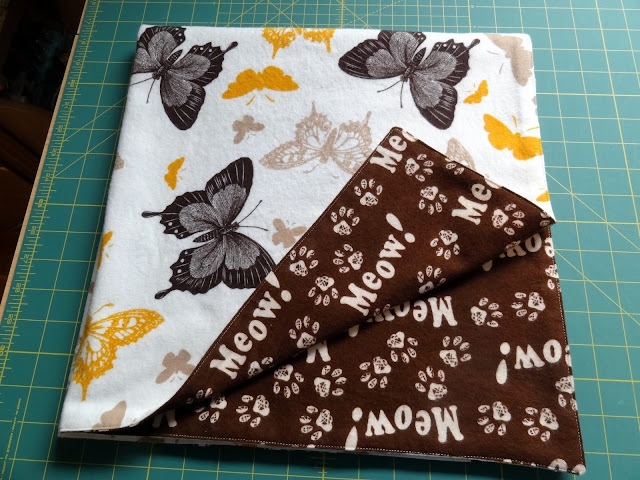 Looks like Sasha will have a nice new quilt to snuggle and a good home. And I'm looking forward to meeting her! How fun. Enjoy introducing the sisters. Lucky you! I hope they adjust to each other quickly. All kittens should have kitten pals. I am giddy with excitement!!! I'm excited that she is going to have a sister too! Can't wait to see pictures! It seems that I have been missing your posts, but I just got caught up! Your yard is look marvelous! Yes, 2 cats are better than one...now Michael wants 3, but I think that is toooo many. AND how lucky you are to meet up with some quilting super stars! I love Pam and Pat especially, I have been following Pam's cute blog about as long as I have been following you. Enjoy your summer and the fruits of your labor! Gracie will be the luckiest kitty to move into the loving Squash House. I'm sure Sasha and Gracie will snuggled together in no time. That is such a cute blankie.